In 50 days (not that anyone is counting), I will be flying down to Walt Disney World to meet up with old and new friends from the Magic In Pixels for Pixelmania 2011! 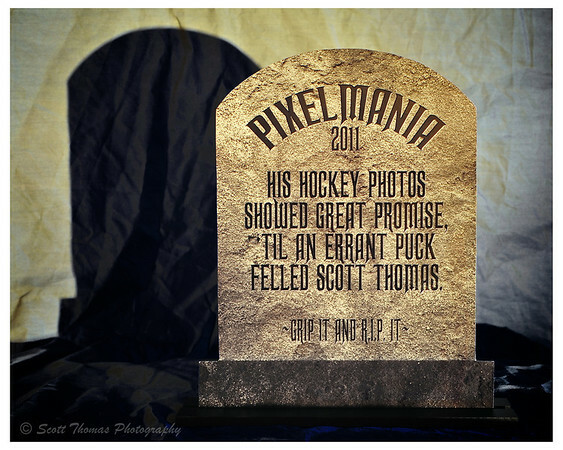 In anticipation of this year’s event, Tim Devine, the head photographer of TMIP, created the Pixelmania Haunted Tombstone personalized gift. In which, you give him your Haunted Mansion-like funny epitaph and $40US and you get your own custom tombstone like mine. Scott's Pixelmania Haunted Tombstone personalized gift. Nikon D700/50mm, 30s, f/11, ISO 200, EV 0, Tripod & LED Light. Even if you can not make it to Orlando, you can still purchase your own tombstone or other Pixelmania merchandise like t-shirts, sweatshirts and/or the official Pixelmania 2011 mounted print by Aaron Johnson from What The Duck.com. What funny and witty epitaph would you use for your tombstone? This entry was posted in Event and tagged 2011, haunted manision, magic in pixels, nifty fifty, nikon D700, photographer, pixelmania, tim devine, tombstone, tripod, walt disney world. Bookmark the permalink. thanks, scott. looks great and looking forward to seeing you in a few weeks. You’re welcome, Tim! See ya soon! You think? 😀 I have to thank the gang at TheMagicInPixels.com for coming up with it. I have no talent for such things. LOL….that’s great! Just substitute your name in place of ‘her’ on the last line. That’ some stone you got there. For myself? That’s something to think about…. There are many of these kinds of epitaphs around the Haunted Mansion attraction at Disney themeparks. That’s where the inspiration for mine came from. All are funny little limericks. Very cute and clever! I do envy you your trip! How much fun must it be to take pictures at Disney World with others that are interested in photography. It is great fun. It is also just as fun to do the same with local people. Have any camera clubs or meetup groups near you? Awesome tombstone! Mine would definitely have to say something about zombies. absolutely. you come up with a poem, we can make it happen!